I first became aware of greenhouse gases and their ability to warm the planet about 50 years ago. At that time I could not believe that we could burn enough fossil fuels to significantly increase the level of CO2 in the atmosphere within about five years I had to accept that we in fact doing just that. In the 1970s ( That is BI Before Internet) it was suggested in the media, that we would soon be entering a colder period, similar to the cold period in Europe during 17 to 18 hundreds. I thought that the small amount of warming which might possible be occurring, would just nicely take the edge off the cooling. By the 1990s it was clear that the warming was not going to stop any-time soon unless we curbed our use of fossil fuels, but I believed that as we would soon run low on oil ( peak oil) the problem would be solved as the cost would become so high for oil, that renewable alternatives would become commercially more attractive. Of course eventually this will happen, but by then it will be far to late as far as the climate is concerned. It has only recently become clear to me that peak oil is in fact many decades away due the the huge increase in oil reserves as a result of fracking technology. It is believed that America will become self sufficient again in oil and gas around 2035. By the early 2000s I thought that while global warming was going to create some pretty serious problems it was unlikely that we would reach any of the so called tipping points, where the process becomes self amplifying. It is now clear that we have passed this point for the Arctic, on two fronts, first the permafrost is melting releasing methane a greenhouse gas which is many times more potent than CO2 and secondly that some 80% of the sea ice has melted since the 1970s causing a much larger area of ocean to become a net absorber of heat rather than reflecting the heat back into space. At some point I thought that nuclear power might be an alternative, but the more I have looked into this, the clearer it has become to me that we are a very long way from using this resource, either in a clean way, or an economic way. It maybe possible in the distant future but not in time to provide a viable alternative energy solution to reduce fossil fuels to a level where they no longer pose a major threat to the planet. I did have considerable faith that renewable energy could supply enough of our energy needs to stop CO2 levels increasing, and I thought that eventually this would start to happen. Unfortunately while the production of renewable energy has indeed increased dramatically, the reality is that this has not been fast enough, to even dent our increasing consumption of fossil fuels. In the same line of thinking, I also thought that burning natural gas would extend the time we would have before we have to take radical action to prevent global warming (that is if we ever do). I can only think of one point I got wrong which might have a small beneficial effect and that is I did not believe that increased levels of CO2 in the atmosphere would have a fertilising effect on plants. On balance It would appear that it does, with a notable example being the sweet potato which is nearly twice as productive in high CO2 environments. yeah, some of the biggest sources of carbon emissions are the materials needed for nuclear like concrete and steal and even the refining of the nuclear fuel... not very low in emissions when you look at the bigger picture. prepare for peak food and peak monetary value. A decade ago I heard that we had 18 months worth of food, 5 years ago that number was 5 months. That means that a disaster on one continent can result in world-wide food shortages and of course that will be the poorest countries who we will not be aware of. All the governments of the world are printing money fast to stave off a depression. This results in inflation but they calculate it differently now so it still looks low but you know that everything you actually buy is more expensive. After these disasters (worthless money and empty grocery stores), then you will be hit with the weather changes... do you have an efficient house with a self-sufficient food and energy production system? Better be buying that needed glass and insulation you need for that before the world catches on that starvation and freezing/boiling temperatures are going to hit when the power/energy distribution is at failing point due to lack of monetary value for upkeep of the systems. It just so happens that a self-sufficient lifestyle (as long as you are not burning stuff) is a very low carbon lifestyle... as if that really matters after the disasters hit. Interesting history, warmair. I do hold out some hope that a 90% reduction in HGHGs by 2020 will give us a chance to not completely cross those Arctic tipping points. We do have the technology for Gen IV reactors, solar, wind, tidal, and wave generators among others. It is just a matter of the will to use them enough and in time, which, although there is hope, is doubtful. My own knowledge was more on overpopulation starting in 1967. I didn't get into AGW until reading a 1992 book. Later, I read "Thermageddon", and thought that surely people would not allow such things to happen. After all, they had stopped the use of freon to save the ozone layer, somewhat. I knew the quickest way to reduce emissions was to reduce population, which I had earlier hoped people would just naturally do, to avoid the horrors of the mid century crash. The point was passed at the turn of the century where even world wide one child families would prevent it. There was still hope to reduce emissions enough with global efforts, to stop the methane turnover to AETM and ELE worse than the K-T "event". It is like many in the AGW field have their heads in the sand about it. They encourage a more slow reduction than actually required to prevent ecocide. Some divert attention to the good things like longer growing seasons up north and some plants that are good growing faster. They overlook the bad things like some noxious plants also growing faster or the population crash, or the forest fires, droughts, floods and eventual hostile environment of the biosphere for a very long time. Some have called for a mobilization of action similar to WWII, highly resisted by corporate entities. I had one child at 39 in 1988 and went totally solar 1998, and hoped to lead by example and walk the talk. There have only been few nearby who have gone solar. Letters have been answered with form letters, two to the editor published and others not, emails answered by robot, and a few with form letters, same with numerous faxes. On line, I have convinced a few to have one or no children and to go solar/wind independent, but not nearly enough. It won't work if only 1 in 4000 do what I did. The thing I got wrong about climate change is the hope that people in general would be wise enough to change their ways in time. Last edited by Johhny Electriglide on Sun Jan 06, 2013 3:02 pm, edited 1 time in total. I found out a real probable game changer on satellite TV last night. A huge Icelandic volcano eruption of ash and sulfuric acid that could negate AGW and its heat in momentum before runaway tundra methane releases get too big. Overdue. Katla has the potential to be around ten times worse than Pinatubo, dingo. Warming has been 10 times PETM, so denying the danger of methane turnover is foolish, especially when tundra scientists reported in 2009 that we were at the tipping point of self release. Last edited by Johhny Electriglide on Wed Feb 06, 2013 2:45 am, edited 2 times in total. This notion of a runaway self-generated tipping point coming primarily from a spike in methane release from the arctic region has been seriously challenged at the 'Real Climate' site. I'm not saying it is a settled issue but I suspect some good climate scientists like James Hansen may have jumped the gun when they proposed this runaway scenario. GHG growth simply treated as a linear AGW generated phenomenon is bad enough. As far as nuclear power I see it as the second worst energy generator. I find anti-nuclear folks tend to be a bit hypocritical when offered the choice between nuclear and fossil fuel. Even the supposedly least offensive fossil fuel source, natural gas, is according to some studies as bad as oil and coal if you are considering strictly its influence on global warming. The leakage of uncombusted methane, a super ghg although not as long lived as CO2, generates an enhanced warming effect. Also I read one report that said the cost of coal's side effects now equal its economic enhancing effects. I don't see where a volcano will negate the effects of AGW other than temporarily with temperature and even there the increased CO2 would simply be sequestered in the ocean. The Pinatubo volcano in the Philippines back in the early 90s I believe caused a temporary temperature down turn. After that temperature continued its rapid rise. To recap the current sate of knowledge. 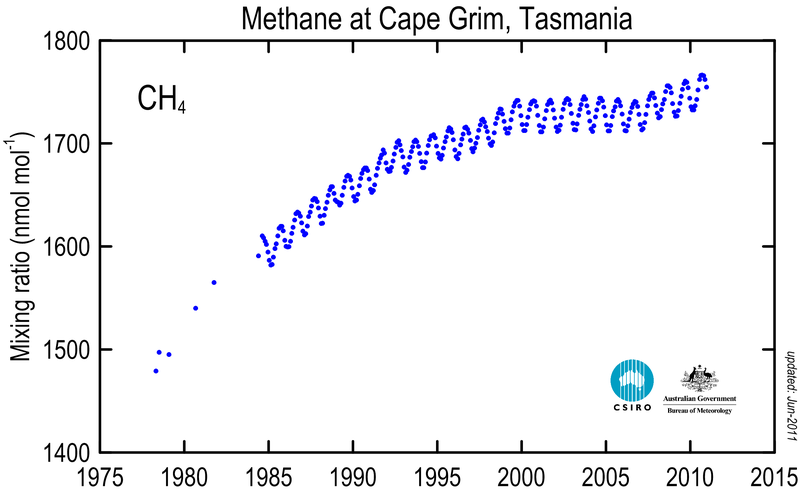 Methane levels in the atmosphere increased dramatically up to the 1980s, but then the rate of increase declined rapidly from then on until about 2005, since then however atmospheric methane levels have accelerated slightly. Links to image but makes a mess of post if I directly link to it. The known sources of methane from man’s activities are agriculture particularly from rice growing and live stock, and industry particularly from oil, gas drilling and fracking. Some of the known natural sources are from rotting vegetation, animal by-products, and decay of Methane hydrates on the sea bed. The main ways that methane is removed from the the ocean is by certain types of organisms in the ocean that consume methane such that some 80% of the oceans methane is currently absorbed before it reaches the atmosphere. In the atmosphere methane breaks down to carbon dioxide and water relatively quickly. The oft quoted is figure is about ten years. The main problem with methane is that at current concentrations it is around 20 more potent than a carbon dioxide as a GHG. The great danger is that the sea will warm to the point where the methane hydrates on the sea floor become unstable and start to emit very large amounts of methane, which will totally overwhelm the natures ability to remove them from the system, should this happen we are stuffed. There is evidence methane emissions from the methane hydrates are occurring but whether they are increasing is open to debate. While I can not make a scientific case large scale emissions of methane will occur, my guess is that should the global temperatures increase by much more than 4 deg C this will become a high risk. This temperature increase is almost certain to occur well before 2200, unless we mange to either reduce GHG emissions or find some way of removing them from the atmosphere. During the course of reading up on this this issue I have have been unable to form a view as to how significant the issue of methane emissions from the Arctic tundra will be. "Climate Risks Have Been Underestimated for the Last 20 Years"
"The world's most authoritative voice on climate science has consistently understated the rate and intensity of climate change and the danger those impacts represent, say a growing number of studies." Also overlooked is the effect on climate and emissions from geologic sources and events that would ruin the world economy and/or food supplies. Three events that are due have this potential; Katla Volcano in Iceland, the La Palma slide/tsunami from the Canary Islands, and the Cascadia R9 earthquake with tsunami in the US NW. Last edited by Johhny Electriglide on Sat Jan 26, 2013 2:59 am, edited 2 times in total. A huge Icelandic volcano eruption of ash and sulfuric acid that could negate AGW and its heat in momentum before runaway tundra methane releases get too big. Overdue. How long would those particulates and aerosols remain suspended? My understanding is that the CO2 in the atmosphere should remain in similar to present concentrations for perhaps thousands of years. Is this correct? No. If all emissions stopped it would take 500 years or less to return to 350ppm, and more to reach the 2 million year average of 230ppm. In the program on TV recently about dangerous volcanoes, it was said that Katla could cool down the Earth 4*C for two years of winter conditions before the particles mostly fell out. Crop failures would crash the population enough so that emissions and temperatures would fall maybe long enough to stop the uncontrollable positive feedbacks, in the Arctic mostly, that are in process of being crossed. The temperatures would rebound to near what they were after 4 years or so, then gradually go down if people quit most of their fossil fuel burning. Or they could go back to the way they were and replace the half of the population lost in 40 years, have an even worse crash and AETM & ELE, or even a possible runaway greenhouse Earth where nothing will live again. "Nicholas Stern: 'I got it wrong on climate change – it's far, far worse'"
"Author of 2006 review speaks out on danger to economies as planet absorbs less carbon and is 'on track' for 4C rise"
What's HGHG JE? GHG I know but HGHG is a new one on me. Apparently overall it doesn't. According to the agronomist expert Lester Brown I believe he says there is something like an overall loss of agricultural productivity of 5% for every centigrade of temperature rise, despite the greater CO2. I believe the reversal began taking place in the 90s.